Featured Below are some Links that are interest to those interested in Natural Care, Training and Living...allowing horses to be horses! 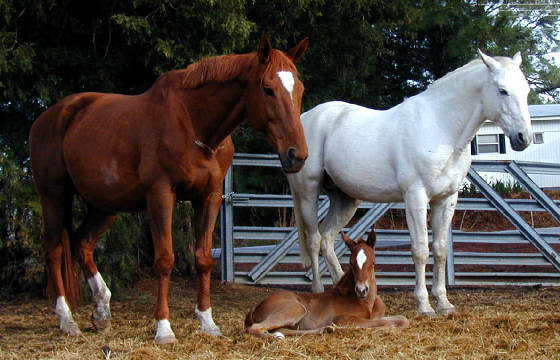 Check back soon for more very interesting links on natural horse and hoof care!! Nicholas had been shown in both dressage and jumping, and had spent the majority of his life living the typical show horse/stallion existance. He was kept in a stall at least half of his life, and then turned out in isolation for a few hours at a time each day...as long as the weather was nice. In 2003, I was introduced to the natural trim, which really only produces great results when horses are allowed to be horses. At first, I was very skeptical, and I still just turned him out by himself in an attempt to keep him from being "damaged" by other horses. The 24 hour turnout helped with the developement of decent hoof growth with the barefoot trim, but his overall health and body condition did not improve until I took the very scarey step of adding his harem into the pasture one mare at a time. This is a stallion that had been "pampered," guarded from injury or blemish with kid gloves! He was ecstatically happy to have the company, although at first he was somewhat confused as to what type of behavior was acceptable. The first mare taught him a few lessons, and he never received more than a scratch. A great part of this was due to the fact that barefoot horses with proper trimming can feel their feet, and really "pull" their punches (kicks)!! That started a whole new life for Nicholas!! I soon added a few more mares to his harem, and he went back into training to compete in Eventing. His entire demeanor has changed, and he has become more mellow, and is obviously secure and happy in his world. Nicholas passed away in the spring of 2005 while breeding a mare. He had never been more content than in the past few years. He will be greatly and forever missed!